These rustic country style wedding invitations feature a set of fallow deer antlers and a horseshoe for the ultimate in country styling. Pictured here printed onto the lovely rustic brown kraft card. The background is printed in a stunning teal blue and the lettering allows the rustic kraft brown card to show through. 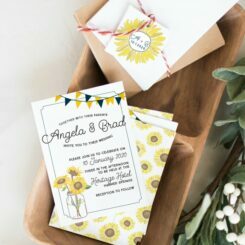 Select a bellyband to finish your wedding invitations – bellybands are a strip of card which can hold all your pieces together and they provide a finishing touch. These rustic country style wedding invitations feature a set of fallow deer antlers and a horseshoe for the ultimate in country styling. The wedding invitations measure 127 x 178mm. Pictured here printed onto the lovely rustic kraft card. The country-themed wedding invitation is decorated with a set of fallow deer antlers and a horseshoe, up for luck. Here a kraft belly band was used enclosing the wedding invitation, to personalise each invite.